An apartment complex was constructed adjacent to an Arizona river that has seasonal water flow. The east portion of the site is bordered by the river, which runs parallel to the site in a north to south direction. The complex is made up of two-story apartments constructed of wood framing and founded on post-tensioned floor/foundation systems. 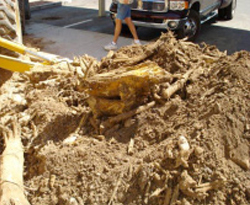 A few years after the apartment complex was constructed, soil-related issues became apparent at two of the buildings. Peterson Geotechnical Group performed a floor level survey and found the levelness of the post-tensioned slab to be over five inches out of level. A review of historic aerial photographs from 1949 revealed that the river historically ran where the distressed buildings were now located. It is unclear from the aerial photographs exactly when the channel was filled in; however, according to the photographs it took place prior to 1999. Based on our initial findings it was our preliminary opinion that the design and construction of the project occurred without consideration for this former river channel that traversed the edge of the site. The soil used to fill the channel was likely undocumented fill soil that was consolidating. 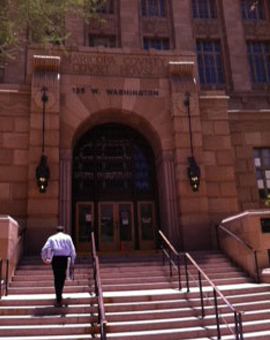 Subsequent geotechnical evaluations revealed the presence of buried trees and poorly compacted fill soil from approximately 15 and 25 feet below the ground surface beneath portions of the buildings. The photograph shows the type of material that was excavated. This material was responsible for over five inches of settlement beneath the buildings which resulted in relatively large cracks in the post-tensioned floor/foundation system, binding doors, large stucco cracks, and an abundance of interior drywall cracks. 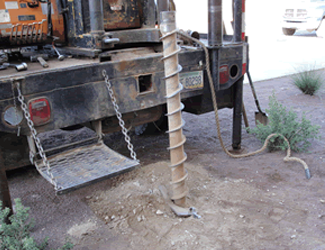 A repair plan utilizing micro-piles and grouting was designed and overseen by Peterson Geotechnical Group. A general contractor in Black Canyon City, Arizona hired Peterson Geotechnical Group to evaluate the cause of distress observed at two residences close to the I-17. The contractor noted that heavy construction, including the installation of a large natural gas line, had taken place near the back portion of these two lots. The installation of the natural gas line caused distress at one of the residences and presented some difficulty in the installation of a new septic system at the other home. We performed an evaluation of the subsurface conditions at the homes by hand-driving a soil sampler and collecting samples of the soil beneath the homes. Laboratory testing was performed on the samples in order to assess the properties of the soil, determine the cause of movement, and formulate a repair plan. From our analysis we determined that the soils beneath one of the residences was not well compacted and relatively loose. We recommended that the soils be stabilized with compaction grouting beneath the interior floor slab. At the other residence, we noted that the excavation for the new sewer system would likely undermine the existing foundation. Based on this observation, we recommended that the foundation be underpinned with helical piles so that the excavation could be performed to install the new septic system. Peterson Geotechnical Group, LLC designed these repairs and provided oversight for their installation. We also provided assistance to the excavation contractor so that proper excavation was performed and damage was not done to the residence while installing the septic system.